Risks due to bacteria, viruses and fungi are omnipresent and the multitude of resistant germs are challenges not only for hospitals. Especially in times of increasing globalization, the dangers of a pandemic are rising. Like a giant wave, flu germs can travel across the whole globe. Experts call it a pandemic. In addition, there are epidemics. This term is used if the illness is geographically limited. "Scientific studies by several independent research groups show without a doubt that copper surfaces can effectively kill off bacteria and other germs", confirms Prof. Dr. Dietrich H. Nies, Direktor of the Institute for Biology at the Martin-Luther-University in Halle-Wittenberg. Under laboratory conditions, it has already been proven that copper surfaces can eliminate germs up to 99 percent within a very short time. Due to the large surface area of the wool, composed of many thin copper strands, and the long dwell time, the bacteria stick and are killed off. The effectiveness of the gauze of copper alloy is added. The protective effectiveness comes from the fact that the ions of several metals have a damaging effect on various pathogens, including bacteria, viruses, and fungi. One speaks of the oligodynamic effect, which is strongest in silver and copper. Even antibiotic resistant bacteria are killed off. The American Environmental Protection Agency (EPA) confirmed the antimicrobial effect. The reason is that copper eliminates certain dangerous bacteria, which can cause potentially fatal infections. The effectiveness of various copper alloys has been demonstrated in the careful analysis of 3,000 samples by independent laboratories. The tests required by the EPA have shown that 99.9% of the bacteria on copper alloy surfaces (with a copper content of 65 % or more) were eliminated. The EPA recognition was preceded by investigations of the British University of Southampton. A tremendous benefit is that this material is not based on chemical biocides and, therefore, is physiologically completely harmless. The copper only attacks microorganisms and is, of course, completely harmless to humans. For the pharmacy edition, a strong silver-containing material is used for the bottom cloth, which intensifies the antibacterial effectiveness significantly. This way the excellent antibacterial properties of both metals are combined and the mouth guard is even more skin-friendly. The antibacterial effectiveness of silver has long been known and its use in various areas of medicine has been well documented. 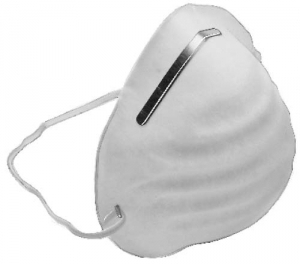 By the warm, moist air can bacteria quickly go through a simple respirator. 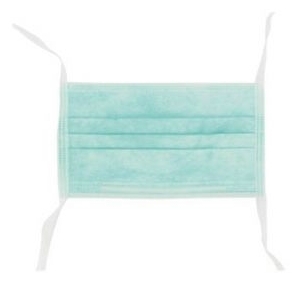 As shown by laboratory tests after a few minutes the back sides of simple masks are all covered with bacteria. Only the Ding filter provides reliable protection against bacteria.